Washington, D.C.: The federal judge overseeing the criminal case against longtime Trump friend Roger Stone said Friday she is considering whether to impose a gag order after Stone went on a weeklong media blitz to discuss the allegations against him. US District Judge Amy Berman Jackson told prosecutors and Stone’s attorneys to file any opposition to such a directive by next Friday. 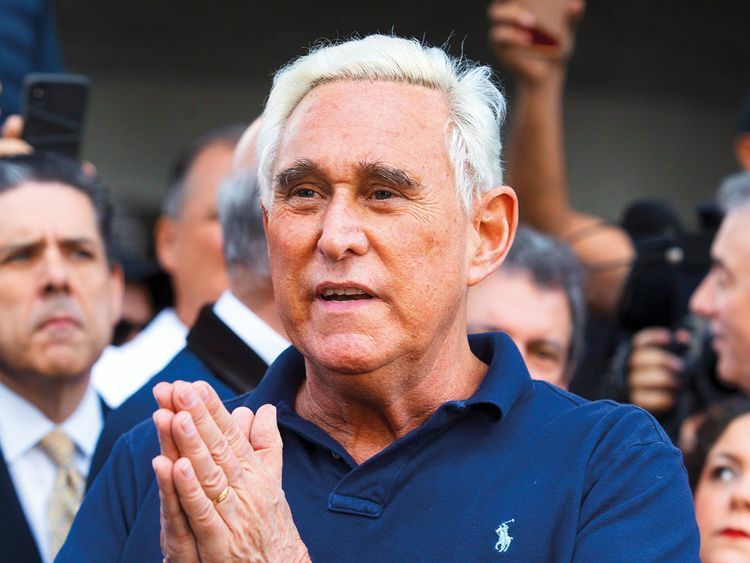 Stone, a political operative who relishes press attention, has said he worries about a possible gag order because his career is in speaking and writing. Jackson’s comment came as Stone returned to federal court in Washington on Friday for a scheduling hearing after pleading not guilty this week to charges in special counsel Robert Mueller’s investigation of Russian interference in the 2016 US election. Stone, 66, a longtime GOP operative and self-described “dirty trickster,” entered Courtroom 3 wearing a charcoal grey suit with broad pinstripes and a billowing paisley pocket square. He sat with two lawyers to his right at the defendant’s table. Stone is charged with lying about his efforts to gather information concerning hacked Democratic Party emails that were published by the WikiLeaks organisation. Stone has pleaded not guilty and vowed to fight the charges. In the months he has been under investigation, Stone has given numerous interviews, and has vigorously attacked prosecutors’ case as he has sought to raise money for his defence. As recently as Thursday, he hosted a news conference to take questions from reporters. It remains unclear how soon Stone could go to trial. Prosecutors said they had discussed possible October dates with Stone’s defence, but Jackson said she was hoping for July. She set another hearing date in the case for March 14. “Yes, your honour,” he said when she asked if he could hear a bench conference through earphone. Ahead of Friday’s hearing, prosecutors and Stone’s defence lawyers agreed in court filings on a proposed protective order to keep secret evidence turned over by the government, and to waive Stone’s normal speedy trial rights, citing the case’s complexity. Stone is free on a $250,000 (Dh918,125) personal recognisance bond on the condition that he not possess or apply for a passport and not travel outside southern Florida, the Washington area and New York City. US authorities in July indicted a dozen Russian military intelligence officers on charges they hacked Democrats’ computers, stole data and shared those files to disrupt the 2016 election. The indictment does not name the campaign official or who directed the alleged outreach to Stone. People familiar with the case identified “Organisation 1” as WikiLeaks, the global anti-secrecy group founded by Julian Assange.